The Baltimore based band Animal Collective took an interest in The Ocean Foundation’s efforts and wrote an exclusive song just for this website. The song, “Suspend the Time,” features sounds from coral reefs and is available for download exclusively through the OA Day of Action website. 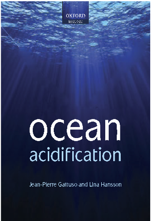 To contribute to the goal related to ocean acidification described in SDG14, continuous accumulation of ocean pH data is needed. There is great need for quality instrumentation to assess and monitor slight changes in seawater pH. To meet this need, JAMSTEC and Kimoto Electric Co., Ltd., have developed an in situ highly accurate pH sensor (Hybrid pH sensor: HpHS) for long-term seawater pH monitoring. The HpHS has two types of pH sensors (i.e. potentiometric pH and spectrophotometric pH sensors). HpHS corrects the value of the potentiometric pH sensor (frequently measuring) by the value of the spectrophotometric pH sensor making it possible to calibrate in situ with a standard solution. Mote Marine Laboratory research in 2018 strengthened the concept that seagrasses could help protect nearby coral reefs from ocean acidification (OA), a chemistry shift occurring as part of global climate change. The research, led by Mote Ocean Acidification Program Manager Dr. Emily Hall and in prep for submission to a peer-reviewed scientific journal, examined coral physiology in the presence of seagrass in the lab and in the ocean. 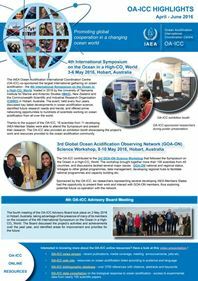 The Ocean Acidification Community of Practice (OA CoP) was initiated in 2018 and is sponsored by the Marine Environmental Observation Prediction and Response (MEOPAR) Network. MEOPAR was established in 2012 and is supported by the Government of Canada through the federal Networks of Centres of Excellence (NCE) Program. MEOPAR Communities of Practice (CoPs) bring together researchers, practitioners, policy-makers, and community members to share expertise, to learn, and to provide a space for discussion and co-production of knowledge. The OA CoP aims to inform MEOPAR, as well as individual researchers, about leading-edge developments for Ocean Acidification research in Canada as well as identify current gaps and opportunities for new research. The OA CoP strives to improve linkages and share knowledge between researchers, policy makers, First Nations groups, fishing and aquaculture industries, and Canadian citizens.